Their is an interesting story behind this post, so please bear with me on this one. A few weeks ago I was browsing Pinterest as I am wont to do and I saw that my pal Chatter Blossom aka Jamie had posted this picture on one of her boards. I was really excited because this is the image that I based my thesis dress off of, the one that I am wearing in this post. 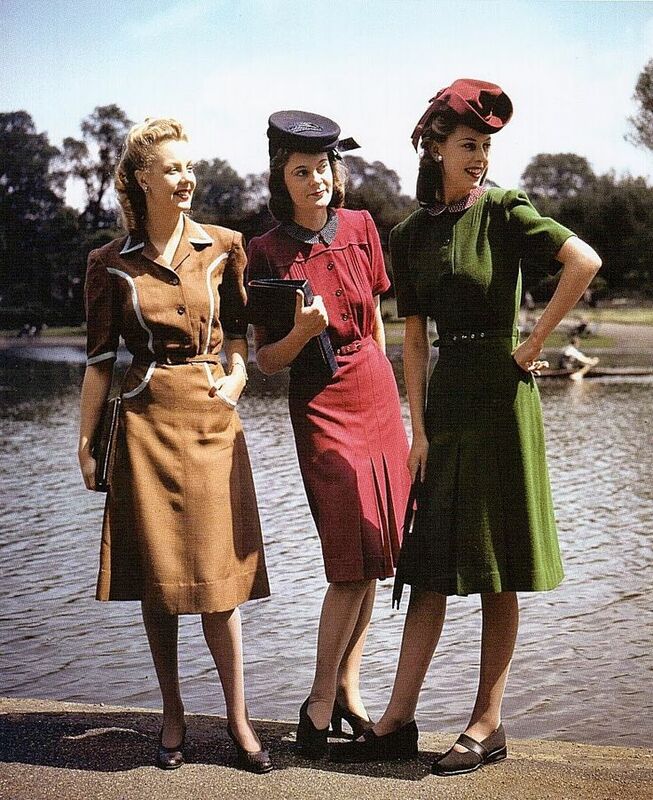 When I was doing research for my thesis paper (which focused on how WWII affected women's fashion) I found this image and just fell in love with it. For our thesis' we had to make a practical portion for the presentation and I chose to make the dress on the left. I left a comment on the picture and told Jamie this and then tried to find an image of me wearing it on my blog. I quickly discovered I had never worn the dress on here before! I was a little surprised by this and vowed to do an outfit post in the future so that I could show her my re-production. So Chatter Blossom, this one's for you. P.S. I have another very exciting post coming this afternoon so please come back and check that out! Oh my gosh, I just wrote a big 'ole comment and then I think it erased when i signed in my twitter to actually post it! Darn it! If this posts twice I apologize but I just wanted to say thank you for posting this for me!!! It is so great and cannot believe you made such a fantastic dress! It looks SO much like the old photo and I love the color you chose!! Glad you did this because that dress needed to be shown! I hate when that happens! Sometimes technology is not our friend. It didn't post twice so no worries. You're welcome, it was no trouble :) This is one of my favourite things that I have made, I was really proud of how it turned out. I was surprised I had never put it up on here to begin with, haha.